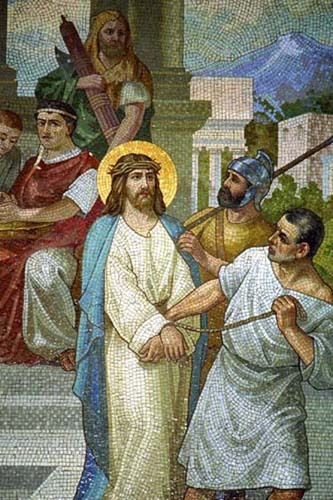 The first station is that of Jesus being brought before Pilate and He is condemned to Death. Those around Jesus left Him and did not defend Him. Those who were healed by Jesus also did not speak up. Pilate asked what “ He should do with Jesus” and the crowd replied “ Crucify Him”. Pilate then washes his hands and says the blood is not on his hands but the crowds and Jesus is condemned to death. When I think of this station I have always seen it as a two fold reflection. One is from the point of view from Jesus and the other view is from Pilate. First let us reflect on Pilate. Have you ever condemned someone without having real and factual evidence and just based your decision from hear say? Have you ever put the blame of the outcome on others so you can feel that you had no choice or no part of condemning someone? When we condemn someone without hearing the whole story or only listen to the voices of others we are acting as Pilate. Sometimes we need to block out those voices that are trying to control and dictate our decisions. Not every person around us has our best interests at heart. We need to listen to our own heart and mind. Filter out all the voice and focus on what is the truth and not the hearsay. Pilate did not know Jesus by let others dictate to him. It is almost the same as the saying “ Don’t judge a book by its cover”. We need to get to know people before we decide who they are and what they stand for. We are called not to put labels on people but allow them to show us who they are themselves. When you are faced with making decisions about people think of how Pilate handled it and remember once you condemn someone, you rarely get a second chance. Now lets reflect on Jesus. Have you ever been accused of something you have not done? Have those around you turned their backs on you and left you standing alone? When others believe what people say about us, it hurts and we feel betrayed. They listened to others and did not take your own relationship into account or they judged you without knowing you. Labels are placed on us everyday and we carry them. They weigh us down and most of them are not true. Do not let others dictate who you are but be who God created you to be. When people in our lives turn away from us and leave us standing alone it hurts. The pain goes deep because there was a relationship there and now it is in question. People who really care about you will not leave you standing alone but stand by your side and walk with you in the hard times. They will even defend you and your name to others. Those people who are there are the ones that really should matter to you. When people turn their back on you it is their loss. Sometimes the relationship can be reconciled but it is hard to forget what has gone on. When we feel we are being condemned and people have turned from us we need to turn to Jesus for He will never leave us. He will always be there to listen and hold us until we are able to stand again. We are never alone with Jesus in our hearts. Jesus and Pilate are opposite sides of the same coin in this refection. Both men are being affected by those around them. Pilate allows others to rule his choice as Jesus is condemned by those who rule. At times we all have played both Men in different situations in our lives. We need to remember how it is to feel as Jesus did so we may not be like Pilate. Use this Lent to examine who you are more like. Until tomorrow, God Bless, and may you judge and be judged fairly and have those who will stand by you and not turn from you.